If only you knew, Inuyasha... If only you knew! In the InuYasha fandom, there are rabid Kikyou/Inu-Yasha fans accusing Kagome of being a Tsundere Sue or a Clingy Jealous Girl, and Kagome/Inu-Yasha fans react by calling Kikyou an evil whore who still wants to drag Inu-Yasha into Hell with her. Add the Kouga/Kagome shippers who bash Ayame and the Sango/Miroku fans who bash Kuranosuke Takeda too. Speaking of Kouga/Kagome, that pairing gets a lot of heat from Inu-Yasha/Kagome shippers. Poor Kouga is an EBUL misogynist who will never appreciate Kagome the way Inu-Yasha does, despite the fact that he brings her flowers and gives up his whole human-eating lifestyle to please her... and keeps with it, even after he realizes he'll never get the girl. 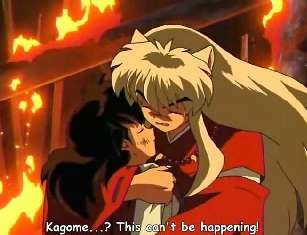 Many shippers who pair Kagome up with someone other than Inuyasha (most commonly Sesshomaru or Kouga, but this extends to crossover pairings with Kagome too) go out of their way to make Inuyasha a Jerkass who thinks of Kagome as only a Replacement Goldfish for Kikyo (despite him explicitly stating in canon that this is not the case) or as a mere Shard Detector. Or even an all-out wife-beater, so that Kagome can be rescued from him by her Actual True Love, conveniently forgetting that she could make Inuyasha stop his supposed wife-beating with a single word. Sesshomaru/Rin and Sesshomaru/Kagome shippers regularly bash Kagura for being Sesshomaru's Implied Love Interest, to the point where some of them have said that they are glad that she died and make fun of her death. Sesshomaru/Kagura shippers don't bash Rin and Kagome as often because most see Rin as a daughter figure and because Kagome is not a threat within canon. They write in fanfiction that Sesshomaru hates Kagura or doesn't care about her, regardless of the fact that in canon he definitely does care about her and saves her repeatedly, breaks his sword and endangers his own life defending her and his Tenseiga transforms into a fighting weapon because of his feelings for her and he vows over the sword to make sure she hadn't died in vain. He almost always leaves her for Rin, never mind the fact that in canon, Rin is a Shipper on Deck for Sess/Kagura and is supportive of the relationship. Fans of the Sesshomaru/Rin pairing will often find themselves being accused of supporting pedophilia, and many Sesshomaru/Kagura supporters have used this argument in fanfiction to justify their own pairing. Even though the majority of Sesshomaru/Rin fans ship the pairing when Rin reaches adulthood, this argument will still be used against them. It is worth noting that even if she does grow older, it might still count as Wife Husbandry because at the end of the manga, Rin has been with Sesshomaru for three years and even after she goes to live with Kaede, he in still involved in her life and providing for her by bringing her kimonos. About half of all Sesshomaru/Inuyasha fic either turn everyone else into psycho homophobes who just want to get into the way of the brothers' true love or make the female characters evil (particularly Kagome) and the rest of the males gay because Het Is Ew. The saddest part of all this is that the character bashing actually occurs less frequently among fans of this pairing than for many others in the Inuyasha fandom.